The HP 8253 is great for printing at home and office, offering high quality prints thanks to cutting edge technology. One of these days your HP 8253 will run low on printer ink, and when it does you'll soon come to realise that new HP 8253 ink is typically an expensive affair. Thank goodness you have no need to bother about coughing up the steep prices you'll uncover on the high street because now at Cartridge Save you can find all the HP 8253 cartridges you'll ever want at very competitive prices. Start to save cash on your ink by buying with Cartridge Save! Why spend so much on the 8253 original cartridge or 8253 compatible ink down the main street when it is far easier to save a bunch of cash shopping with Cartridge Save. You get total confidence when you purchase PhotoSmart 8253 ink cartridges from us because everything is covered by a cast iron money back guarantee. Remember that each order has free delivery, usually arriving at your doorstep on the following working day! 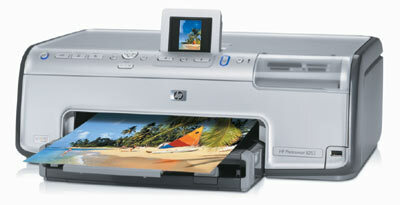 Designed for the photo enthusiast, the HP Photosmart 8253 is an innovative product capable of printing photos fast. It features an extensive set of controls and intelligent software, but still lags behind older HP Photosmart models when it comes to print quality. While it's good enough for photography enthusiasts, it might disappoint professionals. The HP Photosmart 8253 weighs 8.5 Kg and measures 16x44.7x38.5 cm (H x W x D). This large and bulky printer boasts intuitive controls. The centrepiece of the control panel is the 2.5-inch LCD screen which flips up. The HP Photosmart 8253 boasts an optimised resolution of 4800 dpi. The 6-ink cartridge system is composed of separate inks without built-in print heads, so the HP Photosmart 8253 can print more efficiently and save ink. When in draft mode, it prints as many as 30 ppm in colour and monochrome. You can print pictures directly from a digital camera using PictBridge, as well as from your memory card (by inserting a compatible format in one of the 4 built-in card readers). The HP Photosmart 8253 is also capable of borderless and duplex printing, and unlike older models, is already capable of handling transparencies and iron-on transfers. The HP Photosmart 8253 is only fast when in draft mode. It becomes very sluggish on best mode, producing only 2.1 ppm only. Glossy paper makes the output appear oversaturated.